By now anyone interested in the history of Pentecostalism and the supernatural have seen the famous picture of a light Branham claimed was the Pillar of fire that followed him all his life. January of 1950, Houston, Texas rec. W. E. Best of the Houston Tabernacle Baptist church had hired two photographers to take photographs during the de­bate. All the negatives turned out blank (5 of 6) except for the one picture taken of Branham. In his photograph, a column shaped light is above his head. When the story is related by Branham it is called almost always a halo. Which it certainly is not. There are many who had pictures ectoplasm, of ghosts that was circulated before his time. He statement is in conflict with a worldwide community. Are not UFO pictures of the supernatural? 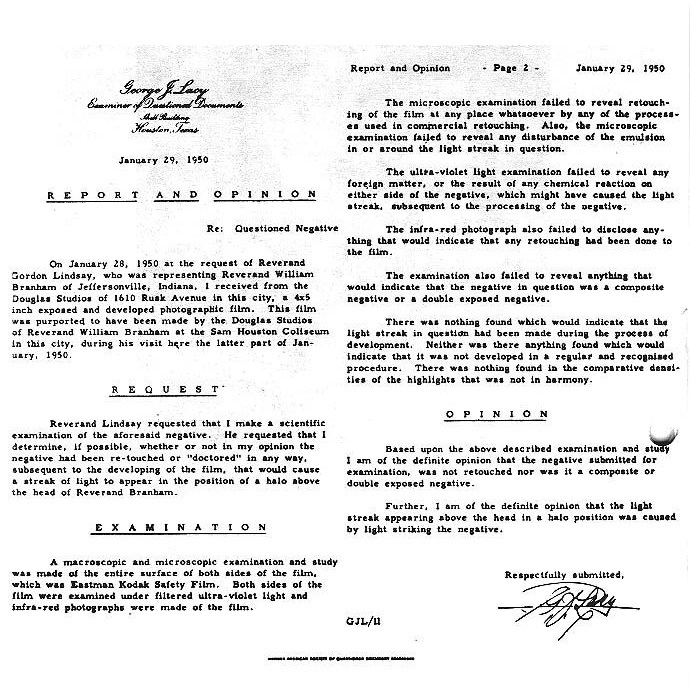 Branham himself said they were angels and there are far more pictures of UFO’s then of his light. Regardless this picture in particular became the sign to vindicate him as a prophet, so they say. And there is absolutely no evidence for these stories, except his claim. What’s supernatural is that no one saw this pillar of light, only the camera picked it up. But that’s not how Branham tells it. According to Branham at the debate of Bosworth who was defending Branham’s ministry against a Baptist (Best) who wanted to argue about healing Branham. Near the end of the debate Branham came to stage for a few minutes, he tells us the Lord then came to have his picture taken as a light above him? The insinuation is that the photographer ran up to take the picture when he saw their reaction to the light, as did so many others. Branham say he was aware of the lights coming. This is not at all what happened at the meeting. People screaming from seeing the light and being escorted by a policeman to his car. Furthermore, Branham adds details to the event that gives even more intrigue by saying all kinds of things said and done by Mr. Lacy. As we go into this further we will see the truth is barely recognizable from Branham’s own words. The FBI did NOT, I repeat they did not test the picture or have anything to do with it. It was Gordon Lindsay who hired Lacy to evaluate the photo and it cost them a good sum of money. Branham said over and over of Lacy “And so he's the head of the FBI.” (53-1129E, Testimony, American Legion Hall, West Palm Beach, FL). But Branham went around saying this when he told his story of the picture. Lacy had his own business and could be hired by anyone. The Houston chronicle said there were 8,000 in attendance. Branham exaggerates the attendees to be almost 4 times the size. Not unlike his other exaggerations throughout his life. Again Branham insinuates the FBI not only was involved, but took the picture. The photographer was hired by Best who debated Bosworth. I want you to notice how loose Branham gets with the facts, how this turns into one of those fish stories. Y’know, the ones like, it was this big, no, it was thiiis big. That’s all is right, that’s all he said. Anything else is an addition. How do we know this? Because he signed a paper with his response on it. Anything more this is complete fabrication by Branham, from his overactive imagination or worse, he is blatantly lying. There is no testimony written or on tape of Lacy saying it was a supernatural being or that it was an angel, that is Branham adding his own words to it. What did Mr. Lacy actually say? Is this what Lacy said? No it is not. He said a light struck the lens, that is all. Branham is putting words in his mouth. We have seen that statement, what he signed did not say It's the only time that a supernatural Being was ever scientifically photographed. Say what? This little light above his head is the pillar of fire? Do you see a light on Branham? Because that is what the pillar of fire did, it gave light to nearly 2 million people. If you want to believe that your welcome to it. BTW I have a car that never runs out of gas, believe it. The question is what kind of light is it. Some people see what they want to see. Or better yet, some people believe what they don’t see. Year after year Branham said what Lacy did not say. And those who believe Branham’s message continue that hearsay as they try to connect the dots of Lacy with the FBI, its just not there. Its all Branham’s words, and since they trust this man they believe everything he says. Go to fbi.gov/history and see if you can find Lacy on their website. You have just read the document, Lacy did not say what Branham is telling you. It’s not there! He NEVER said this, there is no signature for this statement on this document. What proof does Branham have? The same proof we have. The paper that was issued. Those who promote prophet Branham do the same that he did, embellish and add to a story so that it sounds like this is what really happened. It didn’t. I want to warn readers that there are those who have added this portion Former Head: F.B.I. Laboratories to the document that is presented above. It’s not there. How many days did Lacy have the picture according to Branham? Which is correct? 2-3-4-5 days. This is the kind of storytelling accuracy one gets from Branham. According to the document, the photo that was taken at the debate on the 24th. Notice on Lacy’s report that he received it on Jan.28, 4 days after the photo was taken and he took one day to examine it and released it back on the 29th. Can you trust man who can’t get his story straight to tell you about the supernatural occurrences of God in his life? What if you read of Moses saying God gave him 6, 7 8, 9 commandments. Would he be trustworthy when the Bible says 10? Remember he said were the words from Lacy who examined the picture. Which has nothing like this in the only written statement we have, his report. I’m sure the hall of fame is exactly what Branham would like, but it hung in neither. There is no Hall of religious art in Washington DC or NY. Why is it not hanging there today? Because there was no such place. The only place its hanging is in Branham’s followers homes and church, those who believe the tales of the supernatural light and bought the picture. This is a List of museums in Washington, D.C. from Wikipedia. There are a number of art museums in DC but no religious art museum then, or now. And its not hanging there. Once again Branham tried to make his own reality or maybe he was seeing a vision. The facts negate his words, go check it out yourself and see if it is there now, or was ever there, in a place that no one can find. This is how Branham played it loose with the facts. Now I want to propose a point. Even if this light is supernatural, it does not prove by any shape of form that it is the pillar of fire that led Israel, which is the glory of God manifested at a certain point in history. In fact the evidence proves it is not. What evidence? The Bible itself. If this was the same pillar above his head that gave light to Israel at night why did it not light up anything? Why? Think… because it wasn’t the pillar and it wasn’t a light above him. The Bible does not know this. So how does Branham? So what you are seeing in the photo is not just a supernatural being - but God in the photo, God in his true form. Yeah, sure you are! A supernatural something? Like a pillar of fire? Branham sounds real sure of himself. A light that talks to him. So there is a story behind the picture and the facts don’t line up well, especially from Branham’s own mouth. “He was with Moses in the wilderness, sure.” And he was with Branham your new deliverer, sure he is. Branham says he was vindicated by an angel of light… think about it, use your Bible. THINK. An angel of light!